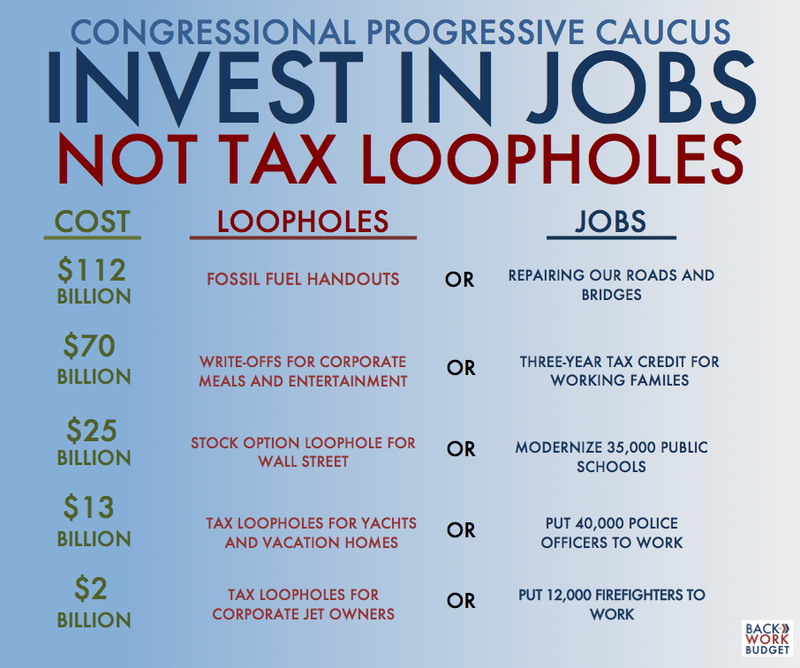 WASHINGTON, DC – Representatives Raúl Grijalva (D-AZ) and Keith Ellison (D-MN), co-chairs of the Congressional Progressive Caucus (CPC), released the following statement in response to a reported agreement in Congress on extending certain tax breaks. 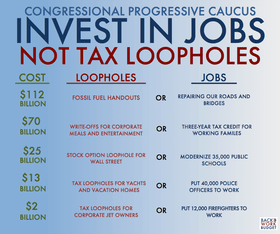 The provisions that are included in the deal, such as permanent extension of tax breaks for corporate research and continued fossil fuel subsidies, will add nearly $450 billion to our budget deficit while providing little relief to the middle class and phasing out renewable energy credits. 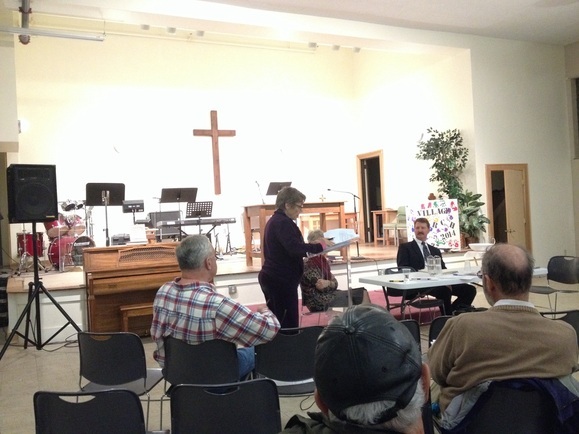 “There may be no alternative sources of drinking water for Ambridge, Baden, Harmony Township, Economy, Edgeworth, Bell Acres, Leet Township and Leetsdale,” said Hamilton of Ambridge. “He put a stop to the drilling there immediately with 300 signatures. We’re giving you almost 5,000 signatures,” Lehman said. Nov. 17, 2014 – Union and elected officials on Monday celebrated a National Labor Relations Board ruling that reinstated four fired UPMC workers and restored benefits and wages to fifth employee for union organizing activities. "UPMC has been acting above the law," City Councilwoman Natalia Rudiak told union members and others who turned out for a news conference attended by a couple dozen people. "UPMC is not above the law." The rally came as Mayor Bill Peduto has been reaching out to UPMC and other nonprofits in the city about voluntarily compensating the city for services in lieu of property taxes. Peduto was not at the news conference Monday, but he called for "long-term financing agreements" with the city’s nonprofits in an address to council Nov. 10. Rudiak conducted the news conference at the City-County Building downtown and called on UPMC to "stop the intimidation, retaliation and legal maneuvers that keep us down." 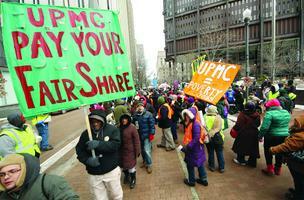 Separating the nonprofit contribution and unionization issues at UPMC would be "dangerous," Rudiak said. The NLRB on Nov. 14 ruled that the hospital giant had disciplined and fired employees for try to unionize, which violates federal law. The Service Employees International Union has been trying to organize UPMC’s Oakland hospitals for nearly three years, but a vote by employees has not been scheduled. Don Blankenship, the longtime chief executive of Massey Energy, was indicted today on charges that he violated federal mine safety laws at the company’s Upper Big Branch Mine prior to an April 2010 explosion that killed 29 miners. A federal grand jury in Charleston charged Blankenship with conspiring to cause routine and willful violations of mandatory federal mine safety and health standards at Upper Big Branch during a period from Jan. 1, 2008, to April 9, 2010, U.S. Attorney Booth Goodwin said. The four-count indictment, filed in U.S. District Court, also alleges Blankenship was part of a conspiracy to cover up mine safety violations and hinder federal enforcement efforts by providing advance warning of government inspections. The indictment also alleges that, after the explosion, Blankenship made false statements to the U.S. Securities and Exchange Commission about Massey’s safety practices prior to the explosion. The four counts charged carry a maximum combined penalty of 31 years’ imprisonment, Goodwin said in a prepared statement. Goodwin declined to comment beyond the prepared statement. The indictment comes after a more than four-year investigation that began following the mine disaster on April 5, 2010, but expanded to examine a troubled safety record that critics have long argued put coal production and profits ahead of worker protections. Assistant U.S. Attorney Steve Ruby has led an unprecedented government effort to link major safety lapses at Upper Big Branch and other Massey mines up the corporate ladder to Blankenship, who was known for keeping a firm grip on every aspect of Massey’s operations during nearly two decades at the company’s helm. Blankenship has previously denied any wrongdoing, insisted that Massey put the safety of its miners first, and promoted his theory that the Upper Big Branch explosion was fueled by an uncontrollable flood of natural gas that inundated the Raleigh County mine. “If they put me behind bars … it will be political,” Blankenship wrote in a May 2013 article posted on a blog he has used to defend his record and attack his critics. 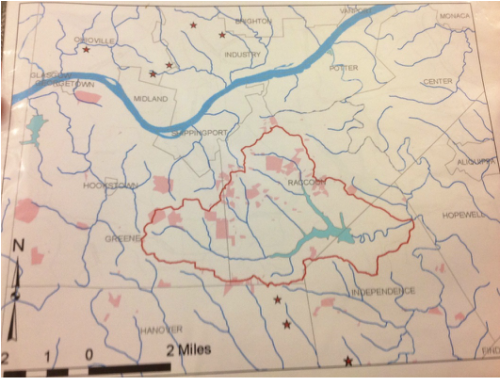 Two government and two independent investigations, though, blamed the Upper Big Branch deaths on a pattern by Massey Energy of violating federal standards concerning mine ventilation and the control of highly explosive coal dust, both of which set the stage for a small methane ignition to turn into a huge coal-dust-fueled explosion. Those investigations all generally agreed that the explosion erupted when the mine’s longwall machine shearer cut into a piece of sandstone. The resulting spark, investigators said, ignited a pocket of methane gas. Investigators concluded that worn-out bits on the cutting shearer contributed to the explosion, while missing water sprays allowed the ignition to spread. Illegal levels of coal dust had not been cleaned up, providing fuel that sent the blast ricocheting in multiple directions throughout more than two miles of underground tunnels, investigators said. Blankenship invoked his Fifth Amendment rights and refused to answer questions from MSHA, the state Office of Miners’ Health, Safety and Training and an independent team appointed by then-Gov. Joe Manchin to probe the Upper Big Branch disaster. Already, Goodwin’s investigation has produced four convictions — including plea agreements with an Upper Big Branch superintendent and a Massey unit president — and a more-than-$200-million settlement with Alpha Natural Resources, which bought Massey in 2011, that required Alpha to fund major safety improvements and create a foundation to support mine safety and health research. For years, Blankenship has been not only a powerful voice in the coal industry, but a power broker whose involvement in West Virginia politics could cut both ways. At a time when a major verdict against Massey was headed for the state Supreme Court, his personal funds helped defeat then-Justice Warren McGraw’s re-election effort and his personal friendship with Blankenship likely helped cost then-Justice Spike Maynard his seat on the court. Republican operatives who helped engineer their party’s takeover of both houses of the West Virginia Legislature in this year’s election got their start working for Blankenship-funded political efforts. 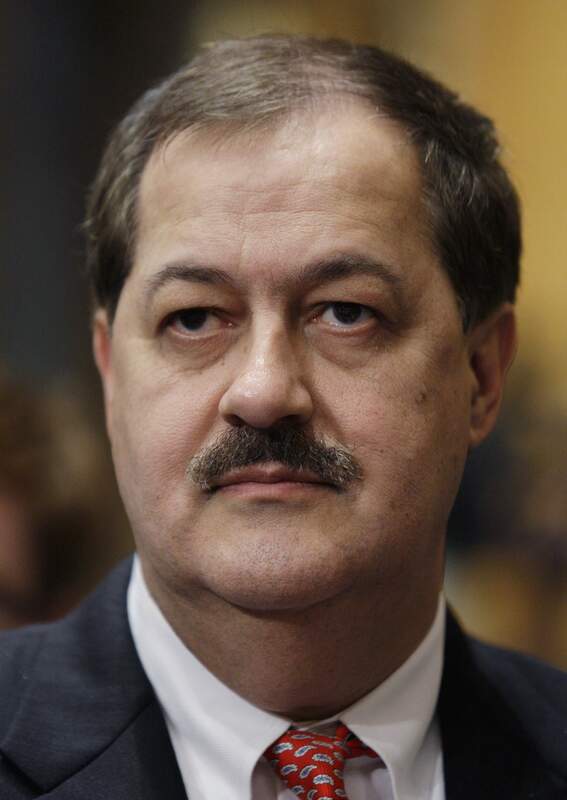 Less than a year after the mine disaster, Massey announced in December 2010 that Blankenship would retire from the company at the end of the year. The following month, Alpha announced its plans to buy Massey. 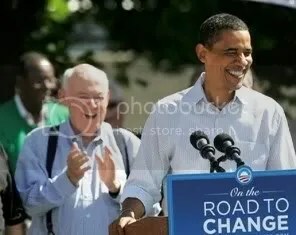 On April 14, Gov. 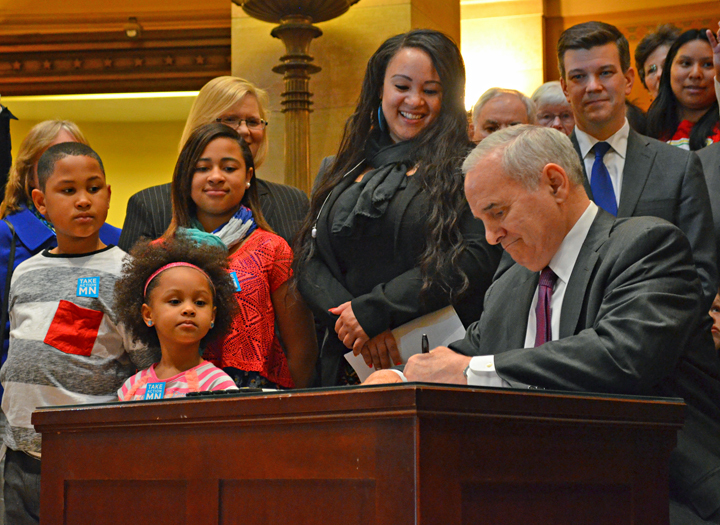 Mark Dayton signed a bill gradually raising Minnesota’s minimum wage to $9.50 per hour by 2016 and indexing the wage so that it keeps pace with inflation beginning in 2018. The bill signing was a victory for more than 350,000 workers statewide who are expected to see a raise as a result of the bill. But it also marked a victory for the coalition of unions, religious groups and other non-profits that united to push the minimum-wage hike across the finish line. 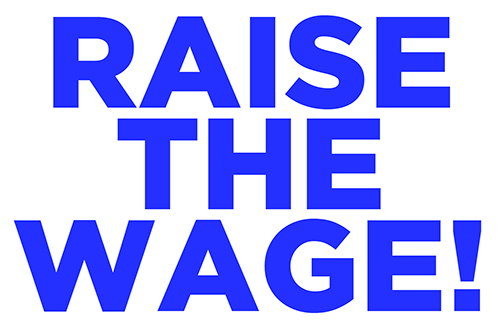 The Minnesota AFL-CIO, the state’s largest labor federation, was one of several union groups that took a leadership role in the Raise the Wage Coalition, which united more than 70 diverse organizations behind a minimum-wage increase. Unions’ leadership role in the Raise the Wage Coalition reflected local action on a nationwide directive put forth at the AFL-CIO Convention in Los Angeles last year. Known as “Resolution 16,” the directive calls on state and local labor federations to build “enduring partnerships” with community groups that share values and goals with the labor movement. With the minimum-wage campaign, Minnesota unions backed up the AFL-CIO’s talk with action, said St. Paul Regional Labor Federation President Bobby Kasper, whose office coordinated 96 volunteer shifts on behalf of the minimum-wage push this year. Nov. 11, 2014 – Six school districts, seven parents, and two statewide associations sued  the commonwealth of Pennsylvania on Monday, claiming legislative leaders, state education officials, and the governor have failed to uphold the state’s constitutional obligation to provide a system of public education that gives all children the resources they need to meet state-imposed academic standards and "participate meaningfully in the economic, civic, and social life of their communities." According to the complaint  (pdf), "state officials have adopted an irrational and inequitable school financing arrangement that drastically underfunds school districts across the Commonwealth and discriminates against children on the basis of the taxable property and household incomes in their districts." As a result, the plaintiffs claim that hundreds of thousands of students throughout the state lack basic educational supports and services—functioning school libraries, up-to-date textbooks and curriculum materials, reasonable class sizes, guidance counselors, school nurses, vocational-ed and college prep classes, academic tutoring programs, and more. "My child is in classes with too many other students and she has no access to tutoring services or support from paraprofessionals, but our elected officials still expect and require her to pass standardized tests," said  Jamela Millar, parent of 11-year-old K.M., a student in the William Penn School District. "How are kids supposed to pass the tests required to graduate high school, find a job and contribute to our economy if their schools are starving for resources?" The state NAACP and the Pennsylvania Association of Rural and Small Schools joined the suit on behalf of their members. Urban, suburban, and rural districts are represented among the plaintiffs. While the state-run Philadelphia School District did not join the legal action, two Philadelphia parents are part of the suit and the Philadelphia Federation of Teachers issued a statement in support on Monday.